Sakai Community DocumentationSakai 19 User Guide (English) Contact UsHow do I use the Contact Us tool? Select the Contact Us tool from the Tool Menu of your site. Click on the relevant link to send a message to the appropriate contact at your institution. Zoom: Click on the relevant link to send a message to the appropriate contact at your institution. Problem with content? Clicking on this link will send an email to the site owner, in most cases this is the instructor of the course. Ask for help? Clicking on this link will send an email to the primary support email address designated by your institution. 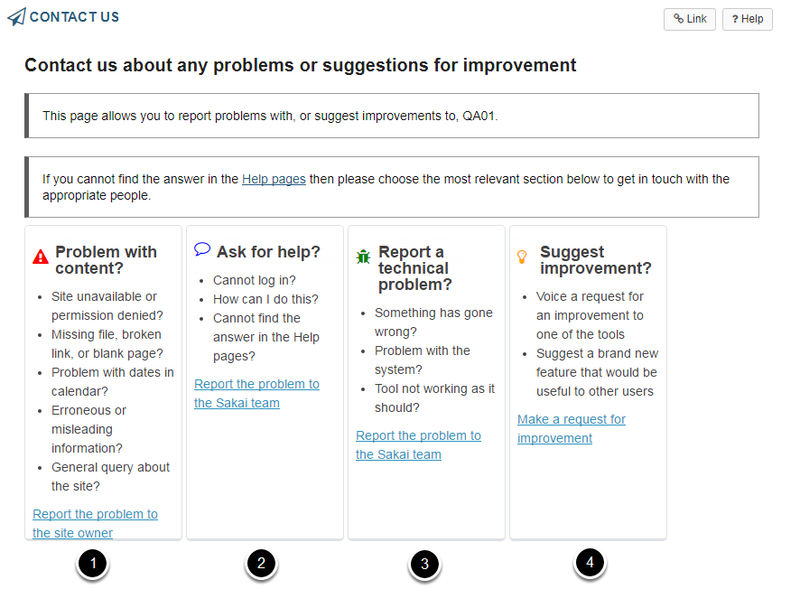 Report a technical problem? Clicking on this link will send an email to the primary support email address designated by your institution. Suggest improvement? Clicking on this link will take you to the web address specified by your institution for the submission of feature requests. Note: The primary support address is specified as the "mail.support" property in the sakai.properties file. Your system administrator modify this email setting by updating the sakai.properties to point to the desired address. Additionally, to enable Feature Suggestion feedback, your Sakai administrator needs to add the feedback.featureSuggestionUrl property to this Sakai server's configuration. Prev: What is the Contact Us tool?